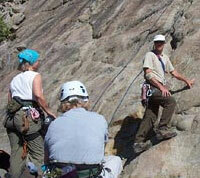 Join Sierra Adventures to test your climbing mettle on some of the finest granite in the world. Welcoming all skill levels we offer beginning to advanced sessions. Intro: A well known secret among the rock climbing community, we have now opened Donner Summit for novice climbers with the desire and ability to learn the basics of rock climbing. The climbing area features granite walls overlooking the famous Donner Lake memorial. climbers will learn basics from the world class ASI Institute. The Tour: Your climbing adventure begins with our complimentary shuttle pickup at any local hotel. Rock climbing is weather sensitive; we help make it easy with pre-trip weather checks and personal service. Plan on a half day of excitement, or add river rafting from our options list for a full day of adventure. Contact us for equipment needs or general information. The Cost: Pricing is structured by group size, length of activity and type of tour. Packaged price includes planning, equipment, transportation, guide service, food and beverage, and any tickets required. Go to the Sierra Adventures price list for the latest information, then pay a deposit to secure your trip. Dates and Restrictions: Activities offered by Sierra Adventures are subject to seasonal restrictions, weather cancellations, and your physical limitations. Call our toll free number - (866) 323-8928 - for more information. Remember to include your email and/or fax number so we may provide package updates, blackout dates or specific information related to your adventure. Suggested Clothing and Gear: Swim Gear / Dry Towel / Sun Block / Gortex or Wool Socks / Gortex or Wool Clothing / Thermax Underwear / Retained Sunglasses.